Looking for efficiency gains in your business? 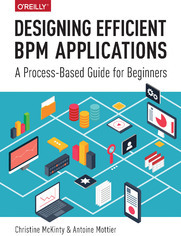 If you...re a business analyst, this practical guide will show you how to design effective business process management (BPM) applications. Every business uses business processes-these everyday tasks help you gain and retain customers, stay profitable, and keep your operations infrastructure functioning. BPM specialists Christine McKinty and Antoine Mottier show you step-by-step how to turn a simple business procedure into an automated, process-based application. Using hands-on examples, you...ll quickly learn how to create an online process that...s easy to use. Each chapter builds on earlier material. You don...t have to have any programming experience to design business processes-and if you have skills in designing workflows and understanding human interactions with processes, you already have a headstart.